About ten years ago I was in Denmark, where my husband hails from, spending the holiday season with his family. With a full schedule of eating and more eating ahead, I had the “brilliant” idea of treating everybody to an “authentic” traditional Dominican pre-Xmas Xmas meal on the 23rd, including a delicious pan de batata (sweet potato cake) for dessert. We were not even in the capital, where finding the right ingredients had a slightly better chance than a snowball in hell, instead we were in a small tourist town away from any major city. This idea of mine proved to be quite the challenge. Even under these conditions, I was still able to procure yuca and platanos in a nearby city, and with considerable diligence, a raw leg of ham. It’s easy to forget that what is common to the point of being unremarkable in our country, is not really so abroad. For a country that consumes a heck of a lot of pork, finding a pernil in Denmark proved to be quite the feat. Since my in-laws own a hotel and restaurants, they have a good relationship with the town’s butcher, who got us one after a couple of days of waiting. Whatever ingredients I couldn’t find I adapted, and substituted. No whole-grain bulgur? I made kipes with peeled bulgur and added a bit of flour to help with the consistency. No yautia or ñame? I made pasteles en hoja with yuca and platanos and added a grated potato to add more starch. Since finding plantain leaves would be impossible in Denmark, I wrapped them in parchment paper. The most difficult part proved to be guandules (pigeon peas) for a moro de guandules. Nobody had ever heard of them. So, I found some dry beans that looked a bit like guandules and decided to try them. Left in water overnight it only took 15 mins. for them to cook soft. The taste is similar to the “ashy”, nutty taste of guandules. It turned out not a lot unlike the real thing. The beans in question are mung beans, a name that Aunt Ilana dug up for me as the bag had a Danish name that my husband wasn’t able to translate. And since finding batatas (Dominican sweet potatoes) in cold Denmark would be akin to finding rødgrød med fløde being served in the Dominican Republic, I used the more common sweet potatoes (the ones with the orangey flesh) and some corn starch (they have less starch than batatas). It worked. A Festivus miracle! 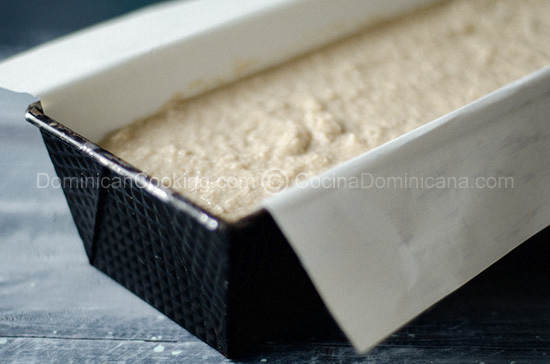 Sweet potato cake is one of those dishes that are very Dominican. With a short list of ingredients, it is easy to make, and full of exotic aromas and spicy flavors. The one in the recipes and pictures are made with Dominican sweet potatoes. The recipe include instructions to adapt to other type of sweet potatoes. While this dish is not generally related to Christmas, I find the combination of flavors and spices very apt for this time of the year. Pan de Batata Recipe (Dominican Sweet Potato Cake): a delicious dessert with a very exotic and spicy taste, the aroma of cinnamon, cloves, and a touch of ginger. Preheat the oven to 350 ºF [175 ºC]. Use a teaspoon of butter to cover a 9" baking pan. Peel the sweet potatoes. Grate with the least coarse side of your grater or pulse in the food processor until you obtain a paste. Add all the remaining ingredients to the sweet potato and whisk until it is well-mixed. Pour the mixture into the pan and bake until you pinch with a clean knife and it comes out clean (about 35 mins). Cool to room temperature before removing from the pan. The variety of sweet potato used for this dessert (batata), although common in the Dominican Rep. might be more difficult to find elsewhere. The potato used for this is a bright purple one with a greenish flesh and very sweet once cooked. If you can not find this type you will need to add three tablespoons of cornstarch to the mixture to compensate for the lower amount of starch in other varieties. Can you put a photo of the sweet potato on this page? Can I use grated coconut instead of finely chopped fresh coconut? I notice that throughout the post you call this both Pan and Pudding. The link even calls it pudding although the recipe calls it pan/cake. It confused me a bit, as I am used to having both Pan de Batata and Pudín de Batata, which is decidedly smoother and softer than the Pan. I explain it in the post and recipe.